From a nationally recognized expert, an exposé of the worst excesses of our zeal for medical testing After the criteria used to define osteoporosis were altered, seven million American women were turned into patients-literally overnight. The proliferation of fetal monitoring in the 1970s was associated with a 66 percent increase in the number of women told they needed emergency C-sections, but it did not affect how often babies needed intensive care-or the frequency of infant death. The introduction of prostate cancer screening resulted in over a million additional American men being told they have prostate cancer, and while studies disagree on the question of whether a few have been helped-there's no disagreement that most have been treated for a disease that was never going to bother them. As a society consumed by technological advances and scientific breakthroughs, we have narrowed the definition of normal and increasingly are turning more and more people into patients. Diagnoses of a great many conditions, including high blood pressure, osteoporosis, diabetes, and even cancer, have skyrocketed over the last few decades, while the number of deaths from those diseases has been largely unaffected. Drawing on twenty-five years of medical practice and research, Dr. H. Gilbert Welch and his colleagues, Dr. Lisa M. Schwartz and Dr. Steven Woloshin, have studied the effects of screenings and presumed preventative measures for disease and ;pre-disease. ; Welch argues that while many Americans believe that more diagnosis is always better, the medical, social, and economic ramifications of unnecessary diagnoses are in fact seriously detrimental. Unnecessary surgeries, medication side effects, debilitating anxiety, and the overwhelming price tag on health care are only a few of the potential harms of overdiagnosis. Through the stories of his patients and colleagues, and drawing from popular media, Dr. Welch illustrates how overdiagnosis occurs and the pitfalls of routine tests in healthy individuals. We are introduced to patients such as Michael, who had a slight pain in his back. Despite soon feeling fine, a questionable abnormal chest X-ray led to a sophisticated scan that detected a tiny clot in his lung. Because it could not be explained, his doctors suggested that it could be a sign of cancer. Michael did not have cancer, but he now sees a psychiatrist to deal with his anxiety about cancer. 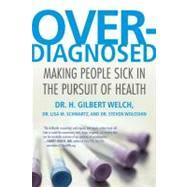 According to Dr. Welch, a complex web of factors has created the phenomenon of overdiagnosis: the popular media promotes fear of disease and perpetuates the myth that early, aggressive treatment is always best; in an attempt to avoid lawsuits, doctors have begun to leave no test undone, no abnormality-no matter how incidental-overlooked; and, inevitably, profits are being made from screenings, a wide array of medical procedures, and, of course, pharmaceuticals. Examining the social, medical, and economic ramifications of a health care system that unnecessarily diagnoses and treats patients, Welch makes a reasoned call for change that would save us from countless unneeded surgeries, debilitating anxiety, and exorbitant costs. temperature gauge and an oil-pressure gauge. they have to be connected to an internal computer to determine what’s wrong. these improvements have much to do with all those little warning lights. the sensor that lights up when it recognizes that another sensor is not sensing). and told you to wait and see if they come on again. been one of the unfortunate few whose cars were worse off for the efforts. repair business: they have led to a lot of extra visits to the shop. find out that one of your check-engine lights is on. I probably have a few check-engine lights on myself. I’m a male in my midfifties. not bragging, and I’m not suggesting that this is a path others should follow. argue that I have missed out on some indispensable service. • I’m six foot four and weigh 205 pounds; my body mass index (BMI) is 25.
makes it worse; alcohol makes it better. PINs and passwords (if anyone needs them, they are on my computer). height, weight, and blood pressure).